Okay folks, this is our first member spotlight. We're going to be periodically doing this, as it gives the team a chance to get to know some of the members. Thanks goes out to Stacy Suchodolski who has taken this idea and run with it! I asked Stacy to help me with this less than a week ago. She got this up and running quicker than I thought. Great job Stacy! First up is long time member Jeff Aronis. I was born on August 29, 1969 (the Summer of Love), and raised in Burlington, MA; the youngest of four (two older sisters and an older brother). I was more into team sports growing up (baseball, football) but did swim competitively from about 5 to 12 years old. I went to the University of Mass at Lowell for undergrad, played lacrosse and earned my BS in accounting. After, I went to Western New England School of Law in Springfield, MA and got my JD. I am a CPA and also have an advanced law degree (LLM; focusing in corporate Taxation) from Boston University. I currently work as a tax planning and research manager for a subsidiary of the Bank of Tokyo in downtown Boston. The big race I am training for this year is IM Switzerland (it will be my 5th Ironman distance race). What advice would you give to your fellow teammates who are training for their first IM event whether it’s a half or full? What advice would you give for those thinking about completing their first IM event? I think the best advice I could give is to respect the distance. You really have to try to get in all those long workouts to see how your body and your mind will react. You go through so many highs and lows on the course, and it really helps you out there if you have already experienced those highs and lows in your training. You can feel great at 70 miles into the bike and feel really bad at 80 miles. But then feel good again at 100. I always try to have everything packed and ready to go the night before. I always seem to forget something if I leave any packing to the day of the race. 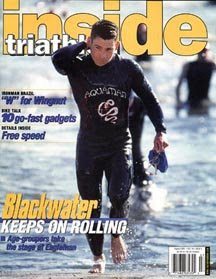 I have been competing in triathlons for 14 years. My first race was the Falmouth Time Out race. I did it on my mountain bike with toe clips and I still think it was one of my better bike legs (sad but true). What drives you to keep training, racing, etc.? I love the variety that you get with triathlon training. If I don’t feel like swimming, I can go for a run. Plus, I need to have something to focus on to get me off the couch. And I also really like being out on the course, seeing my teammates and cheering them on. What is your favorite memory that you had about a race that you would like to share with your teammates? My first race back after my knee surgery was the 2005 Monster Sprint Triathlon in Boston. The surgery occurred the February before and the doctor thought that I would never get back to the activity level I was at before the injury (stress fracture with articular cartilage damage for all you med geeks out there). After a few weeks, I got back in the pool and on the bike but I wasn’t able to do much running before the race. I felt good after the swim and bike, and although I was slow, I got through the run without any pain. After that, I knew I could get back into the long distance races. Any advice that you received from a fellow teammate, overheard at a race or that you learned throughout your life that you would like to share? Why is it that I think "David Hasselhoff" when I see that photo? Is that wrong?